The February Job Openings and Labor Turnover Survey showed a drop in openings of 538,000. Commentary on the February report used terms like plunged and disaster. 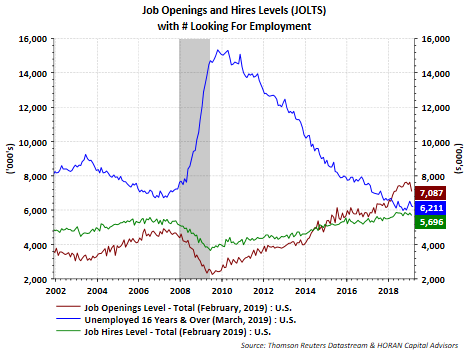 Admittedly, the decline in openings should not be dismissed out of hand; however, it has not been an unusual occurrence for openings to fall as seen in the below chart. Importantly, openings continue to exceed the number of unemployed by 852,000. Some of the job weakness may be a result of the 35-day government shutdown that began late last year and ran into most of January. 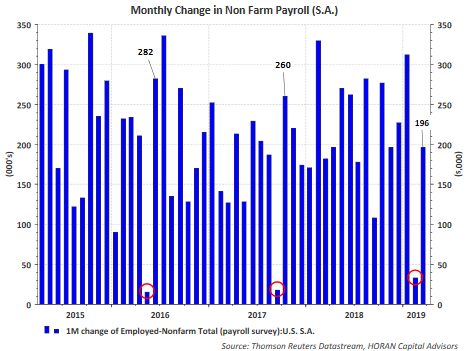 March's nonfarm payroll showed a strong increase of 196,000 after a weak February report. 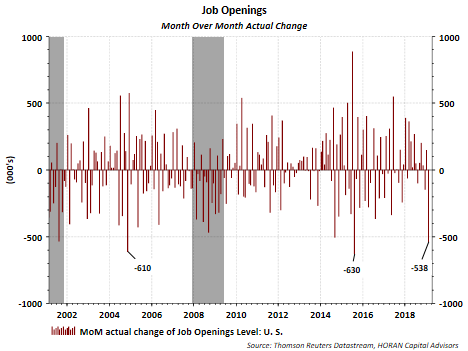 This may be an indication of an improving JOLTS report/labor market in the months ahead.